Dr. Reinertson sought to combine the latest in medical website design graphics and procedure content to enhance patient experience and provide the optimal resource for patients to find the information they’re looking for. Providing a varied range of services and products, her Seattle cosmetic dermatology practice is beautifully displayed in bright, contrasting colors that catch the eye of users and keep them engaged through useful content and interactive features. By showcasing Dr. Reinertson’s expertise in skin care treatments and clinical weight loss through search engine optimized content and interlinking, our team of designers, developers, and writers is able to increase her online traffic and improve the quality of online patient interaction. The artfully crafted website offers a thorough before-and-after photo gallery and an easy-to-use electronic store to provide a more robust experience for patients and to highlight Dr. Reinertson’s many services. Rosemont Media worked with Dr. Jodie Reinertson through each step of the design and content creation process to ensure that her website was of the highest quality and exactly aligned with her standards of excellence. Through our expansive experience in website design for dermatologists and medical professionals, Dr Reinertson achieved a uniquely custom site that stands out in her competitive market of skin care in Seattle. 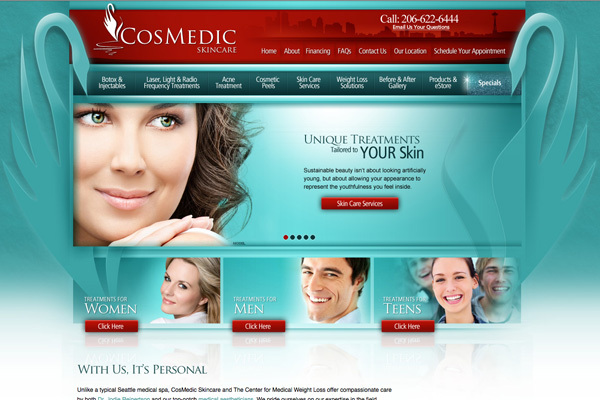 To take a better look at the type of website Rosemont Media can create for you and your practice, visit seattlecosmedicskincare.com.